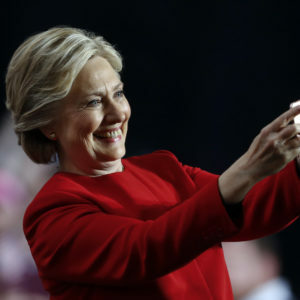 So says Michael Goodwin in the NYPost, who believes that all the political signs point to a potential 2020 run by the failed, two-time candidate. “A crowded, diverse field diminishes the chances of anyone knocking her off. Recall how Trump outlasted 16 GOP rivals by having a committed core of supporters that grew as the field shrunk. Clinton could be in a similar position — unpopular among many, but also unbeatable by a single opponent,” Goodwin writes. On top of the NYPost’s data points, there’s the fact that Hillary just won’t stop talking. She’s on TV almost as much as she was during the campaign, and she’s generating headlines at least once a week. She’s scheduled to speak at the American Federation of Teachers’ national gathering in Pittsburgh this Friday. Who was the first national union to endorse Hillary in the 2016 Democratic primary? The AFT.